Even though entries were down from last year to 11 this year it was a gem of a regatta. Well done to Simon Russell for having the idea in the first place. Sometimes it all just comes together in a certain way. The NOR said courses would be drawn in the sand on the beach and that set the tone of the whole regatta. 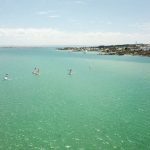 With not much wind predicted and low tides in the Langebaan lagoon prospects before the regatta did not look good. There were some notable absentees namely a complete lack of Edwards’, Blaine was away skiing (and wining) the slalom with Rox in Italy, Richard Ayres was nowhere to be seen and Johnny playing Golf ! 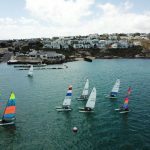 With more than 6 Hobie 14’s on the water it was designated a ‘Hobie 14 Challenge’ and Richard was not there to defend his title. Colin Whitehead kindly volunteered to be race officer with the onerous duty of running the regatta basically from the LYC Pub ! 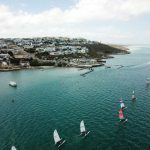 Faced with South Westerly and SSW breezes Colin set an ingenious course in the Lagoon in front of the Yacht Club. 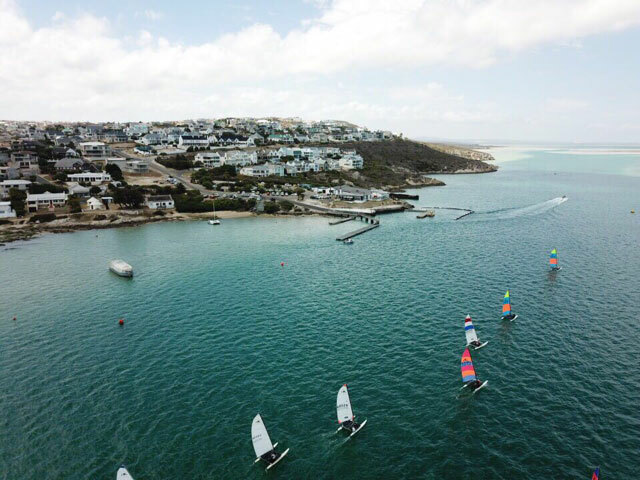 The first start was abandoned due to lack of wind but after a short wait on the beach at Sandbaai the regatta got underway with the incoming tide making the reaching starts interesting. In spite of this Nic seemed to get the starts spot on and raced away to 3 wins on the Saturday followed by 4 wins on the Sunday giving him the dilemma of deciding which 1stto discard. It was real pleasure seeing him hiking the boat flat like a laser getting good speed away from the starts. Simon followed closely with 2 x second places on the Saturday but then Hennie de Villiers at last showed his true speed and after the 3rd race made 2nd place his own ending up a well-deserved 2nd overall pushing Simon back to 3rd. On Sunday the wind took a while to come through but logistics were easy with most of the boats spending the night on the beach at Sandbaai. A relaxed 10am skippers meeting turned for most into coffee at Colin’s House with the start postponed to 12. Unlike the other father in the fleet Simon managed to keep Alex behind him. Young Klaas once again sailed consistently well to claim 4th place showing the youngsters where to tack for the weather mark on the Sunday when most were over-laying it in the stronger trapezeing NNW breeze. 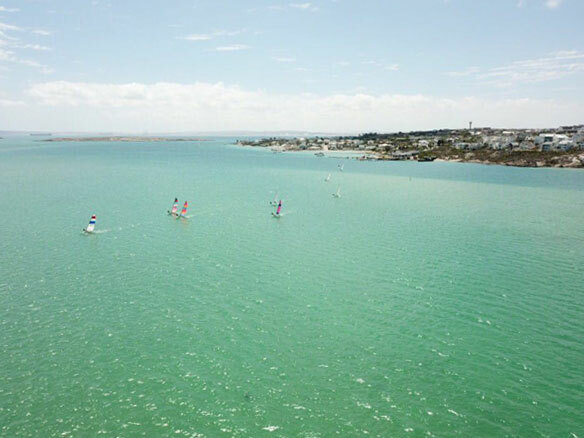 Phillip Kitshoff has obviously finished his chores on his new house in Langebaan so was allowed to sail at last and it was good to see him back on the water. 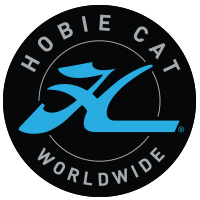 Enthusiastic Hobie 14 supporter David Power seemed to fade a bit on the Sunday after 3 good races on Saturday. Shannon sailed Nic’s spare 14 and showed how she has improved since last year and deservedly again won the Ladies medal. Deon Jeannes again did better on the first day narrowly losing out to Shannon on a discard count back. We were very pleased to welcome Rynhart Vermaak to the fleet – some new blood. Although South African, Rynhart works out of the Netherlands where he was sailing a 49er. In Cape Town he has a 14 and a 16. We hope to see more of him although as with Robert Fine travelling abroad sometimes clashes with our regattas. 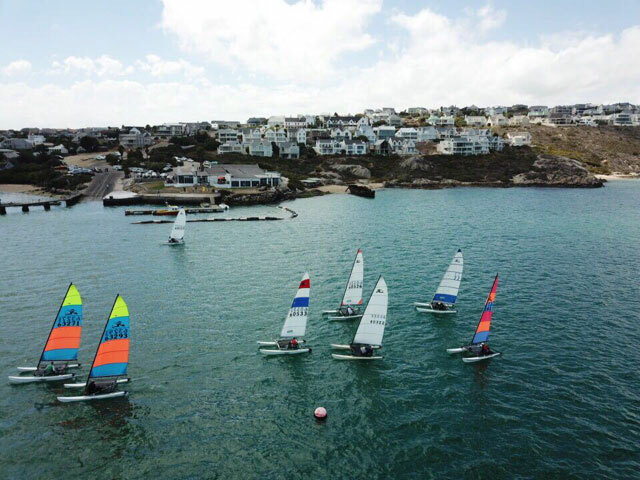 With the likes of Jaco du Plessis threatening to get a 14 and plans to turn this 14 Regatta into a series the future looks good for 14’s in the Western Cape.